Beef round comes from the upper portion of the hindquarter of a steer and has a fat-to-protein ratio that makes for good ground beef. A serving of ground round is high in calories from both protein and fat. Ground Round Beef has 250 Calories and 16.96 g of Protein per 100 gram serving according to the nutrition facts provided by the USDA Food Composition Database. A 3-oz. serving of ground round contains 218 calories, according to the U.S. Department of Agriculture. Around 120 calories are from fats, with the remaining 98 calories coming from proteins. No calories come from carbohydrates. These values are based on ground round with a ratio of 85 percent lean meat to 15 percent fat. The same 3-oz. serving of ground round provides approximately 5 percent of the total daily recommended caloric intake for the average person. This amount is based on a typical diet of 2000 calories per day. The USDA also indicates that a serving of ground round contains 24 g of protein. Fats make up 13 g of the serving; around 5 g of that amount is saturated fat, and approximately 60 mg is cholesterol. The remainder is other nutrients, indigestible components and water. Ground round is high in vitamins, including vitamins E and K as well as the B-complex vitamins. 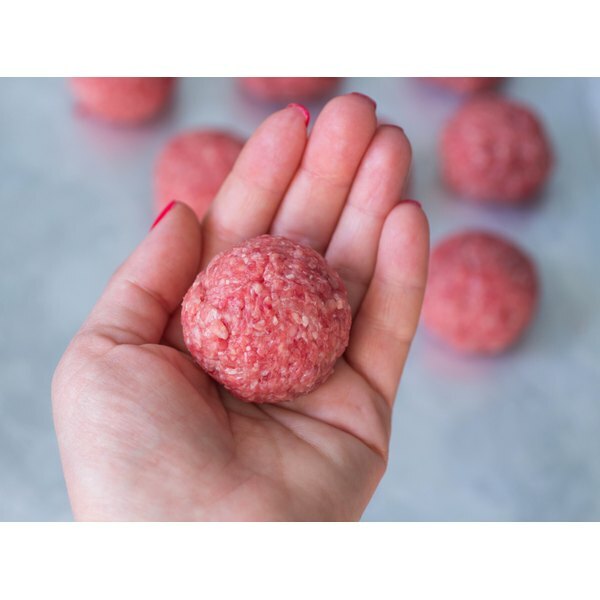 Dietary minerals such as iron, phosphorus, potassium selenium, zinc, magnesium, copper and manganese are also available in a serving of ground round beef.